I had heard about Din Tai Fung for years since I have a friend who was born and raised in Arcadia. It was intruiging to hear about these dumplings that squirt out soup when you bite into them. How do they capture soup in the dumplings when making them?!? We invited a couple other friends along for this Saturday morning brunch. I was told to get there right when the restaurant opens at 10 AM otherwise, we’d have to wait at least an hour to get a table. This place is THAT popular. We had a straggler in the group who arrived 10 minutes late so we did end up waiting a few minutes before we were seated. My mouth was watering before we even sat down because I looked at what other people had ordered. 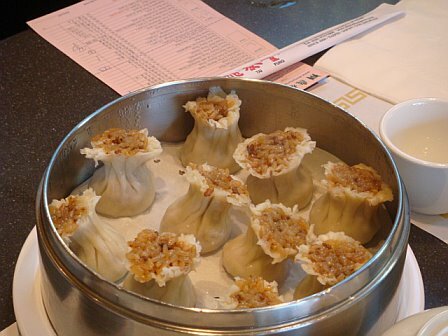 We ordered the juicy pork dumplings (a MUST HAVE), the mini juicy pork dumplings (a weekend special – they were oh-so-cute! ), chicken dumplings, vegetable dumplings, rice and pork shu mai, chicken noodle soup and red bean dumplings for dessert. Needless to say, we were stuffed at the end of the meal. I loved the rice inside the shu mai. It made it very flavorful and filling. 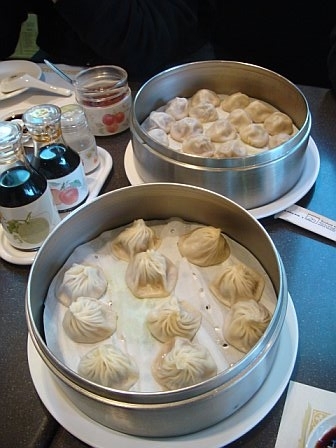 I did a little research and even found a recipe for these steamed soup dumplings called Xiao Long Bao. Inside the dumpling are little pockets of gelatinized broth made from chicken, pork and cured ham. When you steam the dumpling, the broth melts. Genius!! It was unbelievable how crowded this restaurant was when we left and the parking lot was madness too. I would definitely like to go again in the near future but this time, get there right before the restaurant opens or at least right on time! 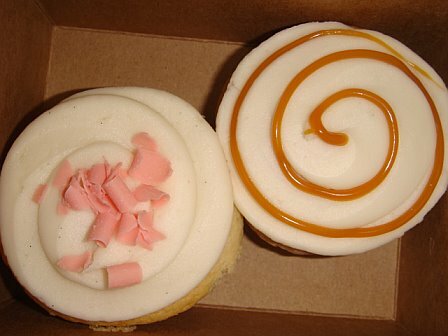 She took our order over the phone: I chose Strawberry Shortcake and Boyfriend chose Apple Pie with a caramel swirl on top. Jill kept stressing how cute the packaging is over the phone so when she brought it over, I got to see how cute the little dots are! 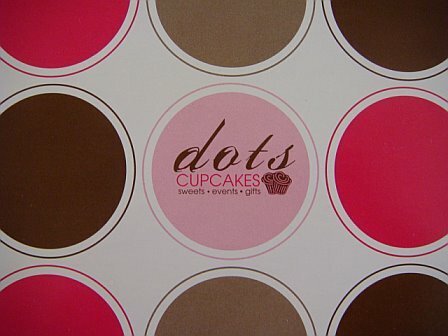 Overall, I might’ve liked the Dots cupcakes better than Sprinkles. *gasp* I don’t really like overly sweet frosting and sometimes I scrape off some of the Sprinkles frosting because it is just too much. 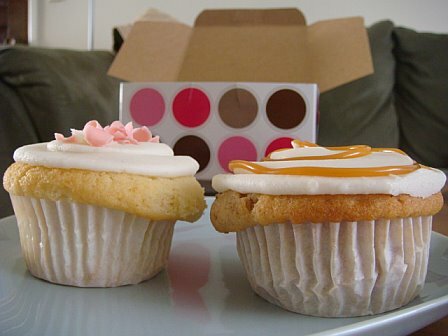 *double gasp* Sprinkles are $3.25 a pop and Dots cupcakes are $2.75/EA. If you’re in the area, perhaps you can judge for yourself and decide which you like better! When it’s cold outside, I feel like warming up with a nice bowl of soup. Campbell’s might hit the spot sometimes but I love noodles, especially udon. 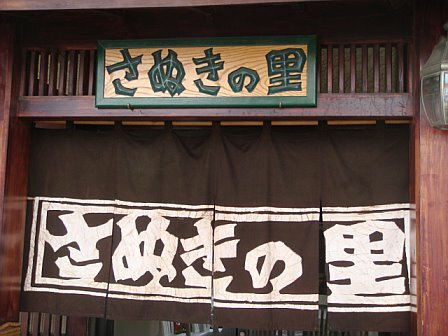 We trekked on over to Sanuki no Sato for lunch… it’s just a few blocks south of where I live so very convenient. Sometimes I feel like I stepped into Japan when I go into this restaurant. I ordered the nabeyaki udon… it comes with shrimp tempura, egg, an abundance of sansai vegetables, chicken, shiitake, and bamboo to name a few. 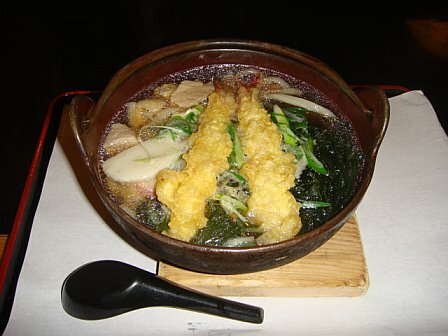 I love the hot iron pot nabeyaki udon is served in because it stays hot for that much longer. We took our chances on Father’s Office on a Saturday night before meeting up with friends on Main. I’ve gotten a seat rather quickly each time I’ve been and this time we got lucky with counter seats before we ordered. I don’t crave burgers often but this one paired with some sweet potato fries and a cold beer really hits the spot. There are absolutely no deletions, substitutions, or modifications to anything on the menu at Father’s Office. They don’t even have your traditional ketchup or mustard for your burger here! 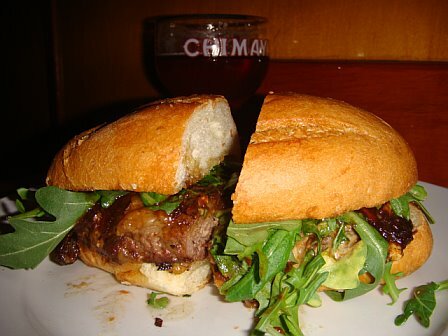 It comes with carmelized onion, applewood bacon compote, gruyere, matag blue cheese and arugula. We had to order a basket of sweet potato frittes “a la cart” with roasted garlic, cabrales and blue cheese aioli for dipping. 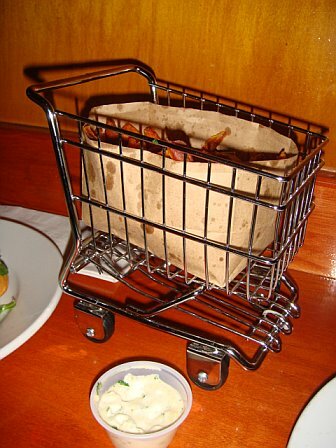 “A la cart” via shopping cart. How cute is that?!? Good thing we shared because one order of frittes was plenty for the two of us. Old habits die hard and mine are no exception. I ALWAYS order the chirashi. 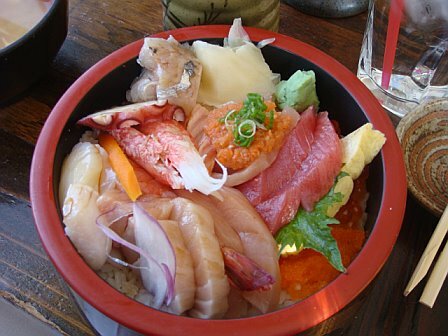 This plethora of sashimi comes on a bed of sushi rice and is served with miso soup and salad. 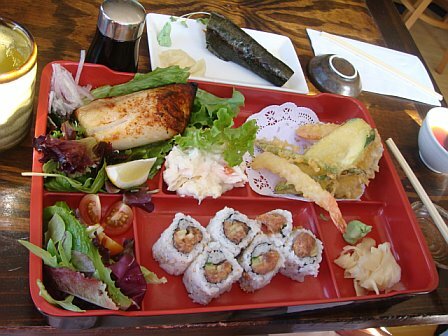 Boyfriend ordered the lunch bento box of the day which came with sea bass, tempura and spicy tuna roll. What can I say, we know how to eat well! 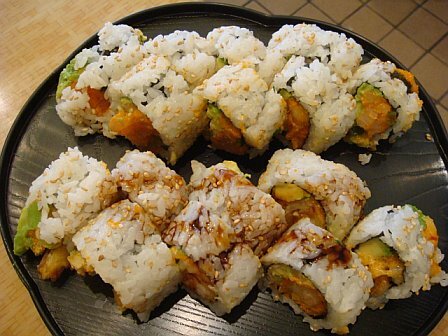 Katsu has happy hour from 5:30 to 6:30 PM with 99 cent Kirin draft beer and half priced hand rolls. I think we’ll be going back in a couple weeks! The waitress gave us free kuro goma (black sesame) ice cream because she said she missed me and was glad to see me. Awww. I love me some good Korean BBQ. We attempted to go to Father’s Office in Santa Monica for some good burgers and sweet potato fries the other night. Bouncer: “I don’t know if this makes a difference to you but we ran out of burgers.” WHAAAT?!?! I didn’t even know that was possible. We left immediately. Since we already had our heart set on cow, we decided we might as well drive over to Koreatown to my favorite Korean BBQ place, Soot Bull Jeep. It definitely hit the spot. 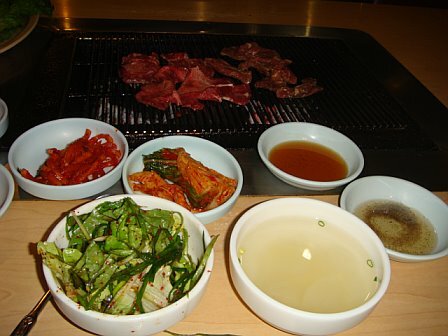 We ordered a plate of kalbi and a plate of gyu-tan (tongue for you non-Japanese speakers) and it was perfect! 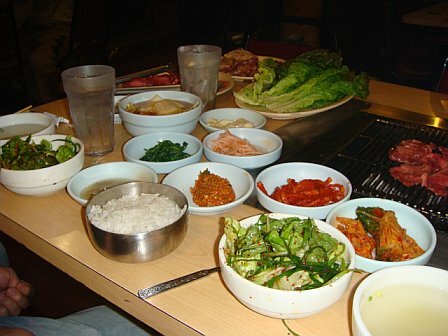 I love all the pickled side dishes at Korean restaurants… kimchee and garlic everything and I’m in heaven. The only downfall to Korean BBQ is that you end up smelling like your food when you leave. Soot Bull Jeep has charcoal grills so in lieu of smelling like kimchee and meat when you leave, you smell like kimchee, meat AND smoke for the rest of the night until you shower. Everytime I’ve gone to Soot Bull Jeep, it’s been super crowded. Parking is hard to find at dinnertime, sometimes the wait is long and there is somewhat of a language barrier between us non-Korean speakers and the waitresses… but I keep going back because the quality of the meat is good and I’ve never left disappointed. I think whatever downfalls there might be are outweighed by the happy stomach in the end! We went on a hike up to the Hollywood sign this past weekend to soak up the sun and great weather. What better way to work up an appetite than to exercise! 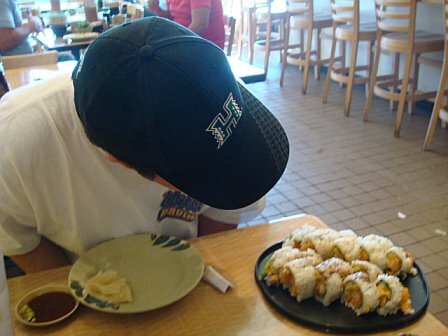 After our 2 hour hike, we decided to treat ourselves to one of our favorite foods: sushi. I’ve been going to CA Roll Factory for a few years now and love the menu choices they have there. They have every roll imagineable at this little hole-in-the-wall restaurant. There are about a gazillion rolls with names that do not identify what is in the roll at all. These are the Tootsie and Woody rolls. (Actually, I can’t remember what the top roll was called.) I ate them so fast I can’t even remember what was in them! Boyfriend had to closely examine the rolls to determine which was which. I was so ravenous that I ate a “crispy roll” before the picture was taken! 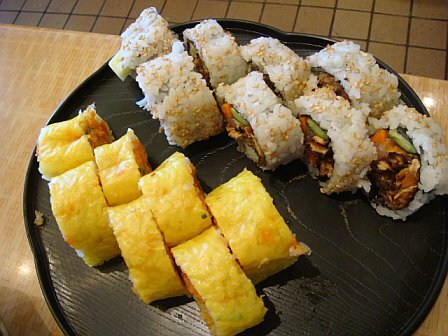 The soy paper is a nice alternative to the traditional nori. Boyfriend chose the Tootsie Roll which was a fancy salmon skin roll. 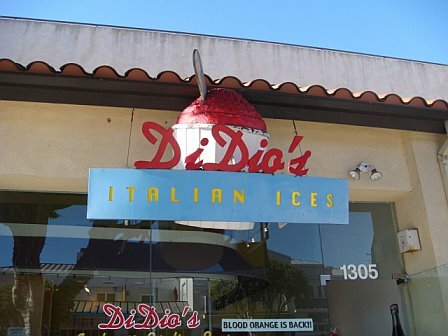 After our lunch, we headed over to Di Dio’s in Santa Monica for Italian Ice. It was the perfect dessert for our upper 70’s weather we had over the weekend. Even though we were full from lunch, we managed to fit in dessert since it IS only frozen, flavored water… the green apple flavor was delicious and mango is a close second favorite! 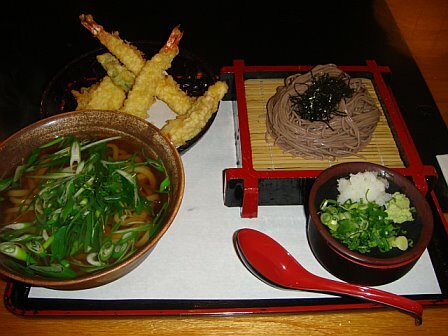 You are currently browsing the For the Love of Food weblog archives for February 2008.